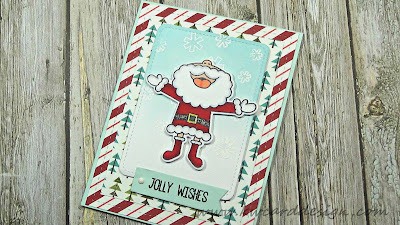 Hi and welcome to another card in my Holiday Card Series - today I am playing with the Avery Elle set called Oh What Fun. This set came out last year, but I love it so much, and wanted to bring it back out for this series. I colored this image during The Daily Marker Coloring challenge, so you won't see me color Santa, but I did basic coloring with my Copics. I also used some pattern papers from the Oh, Deer 6x6 from Fancy Pants. This is another one that came out last year, but I didn't get to use it as much as I wanted to. 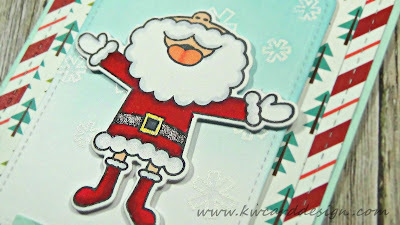 I did create a snow scene on a piece of white card stock for my Santa, by stamping the snow cluster and heat embossing it with white embossing powder. My panel was die cut from the Lawn Fawn Stitched Journaling Card die. I also used the banner die for my sentiment and this is found with the same die set from Lawn Fawn. 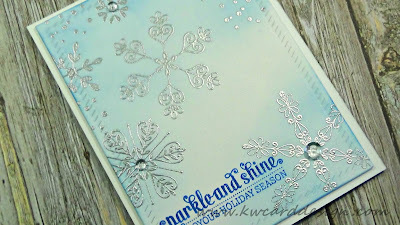 Then, I added some Tumbled Glass distress ink, to bring out those snow flakes. I die cut my pattern papers from the Stitched rectangle die from Right at Home, and the Hero Arts Infinity rectangles. I created a top fold A2 size card out of Sea Glass card stock from SSS, and for a final touch I added one white enamel dot on the sentiment banner, and added some shimmer with my Wink of Stella shimmer pen. For all the supplies used - please see the list below the video tutorial! Thanks for watching!! I love how fun these lights are, and you could do many looks with them! I used all Lawn Fawn inks as they have fun and bright colors! As always all the supplies I use in each tutorial are listed and linked below!! Today's post is short and sweet, so if you'd like to see how this one came together, I invite you to watch the video below! See you soon for Card 9! Happy Monday! I have another card for you in my Holiday Card Series! 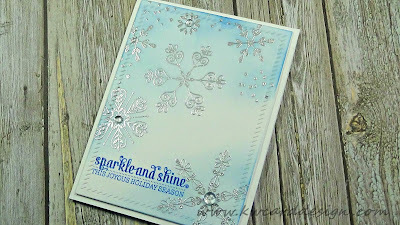 Today I am playing with elements from the My Favorite Things Card Kit called Snowflake Sparkle. The kit is sold out, but good thing that the products are available for individual purchase!! YAY! So I started out prepping my white card stock panel for embossing that I die cut from an Avery Elle frame die called Finished Frames, and I picked out a few of the snow flake images from the Simply Snowflakes set from the kit. 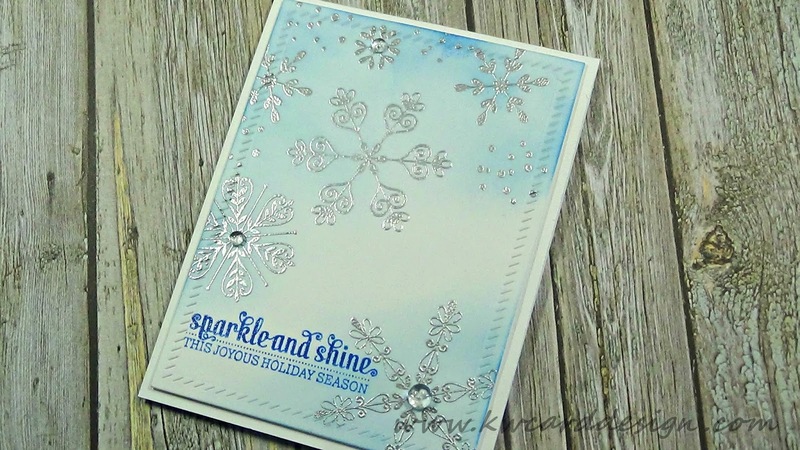 Each time I stamped, I covered them with silver embossing powder so it was easier to see where my images were. Then, I heat to set them with my heat tool. Then, I added my sentiment from the Mama Elephant set, Winter Wonderland. I stamped it with Cornflower ink, and then onto Versa Mark ink. This is an easy task as I used my MISTI stamping tool to do this! A wonderful tool to have!! 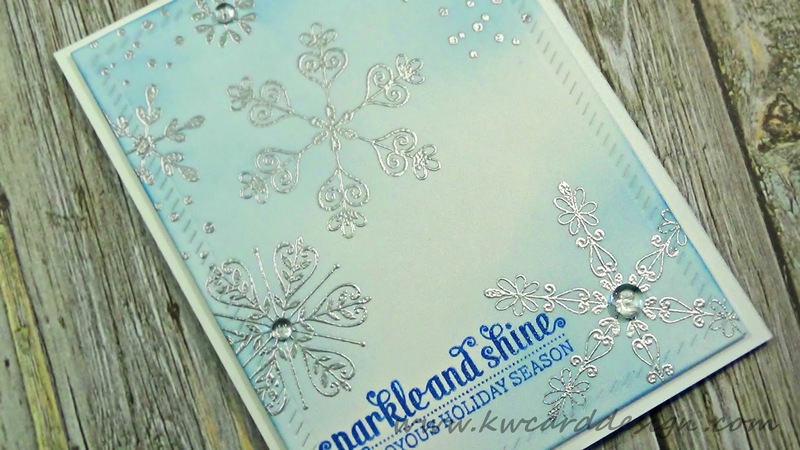 Then, I embossed my sentiment in clear embossing powder. I wanted to add a bit of color around my snow flakes, so I used the same cornflower ink and my ink blending tool and used a light hand to add the color to the background. Once I was happy with that result, I added some foam tape to the back, and adhered it to my top fold A2 size white card base. Thank you stopping in today! See you right back here for card #8!